Air New Zealand offers their international travelers the option to select Business Premier, Business Class, Pacific Premium Economy, Premium Economy Space seat, Pacific Economy, and Economy Skycouch. The business premier class boasts leather seats, an ottoman, the ability to turn the seat into a flat bed, a personal TV, power adapters to charge your USB or iPhone, and more! The Business Class ticket offers a seat that reclines, a footrest, power adapters, a personal tv, and more. 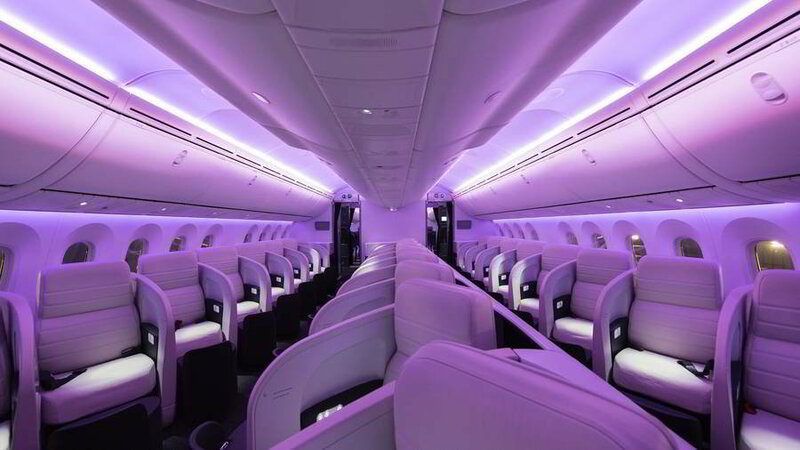 If you are interested in any of the other ticket classes for an Air New Zealand flight, speak with one of Simply Business Class’ representatives to find out more details and whether discount tickets are available. If you fly on Air New Zealand or any of its subsidiary airlines, it is a good idea to sign up for their frequent flyer program. Air New Zealand has a frequent flyer reward program that is called Airpoints. After customers accumulate a certain number of points, they are able to redeem them for flight value on an Air New Zealand flight. Depending on your miles, you can become a Jade, Silver, Gold, or Gold Elite member. Are you tired of wasting time looking for first class or business class tickets online? If so, then we’ve got the perfect solution for you! Simply Business Class offers up to 50% off business class tickets from leading airline carriers. For all of your travel needs, head to Simplybusinessclass.com!